Final Fantasy XV’s Royal Edition update introduces a new first-person mode to the game, allowing players to witness the world of Eos from Noctis’ point of view. Just don’t try fighting with it turned on unless you’ve got a strong stomach. Pressing down the L3 and R3 buttons on the controller (or the N key on keyboard) places the game’s camera inside Noctis’ head (there’s a lot of room). It’s a curiosity, something fun to poke around with during the game’s slower moments. 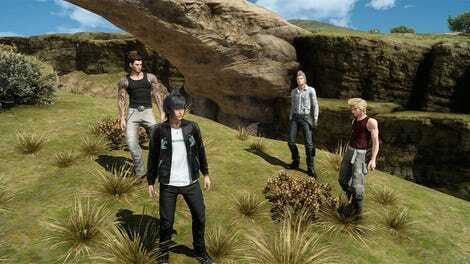 The first-person in Final Fantasy XV can give players a clearer view of the sprawling countryside, or make quiet times with Noctis’ trio of adventure pals a little more intimate. Certain areas really shine in first-person mode. The game’s first real dungeon, for example, turns into some current-gen Ultimate Underworld-looking business with first-person turned on. Well, as long as you ignore the bros behind you. And who could forget the giant spider creature at the end of that first dungeon? How large and frightening she is. How majestic and intimidating. Well, gaze upon her glory in first-person view. How do those feet even work? Sometimes the more intimate perspective falls flat, and almost all of those times are combat. 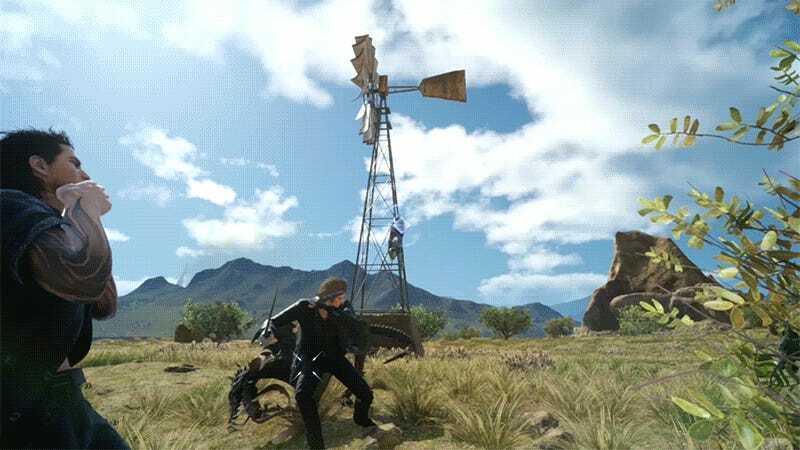 Final Fantasy XV’s battle system is a confusing enough mess as is. Toss in a locked, ground-level view and things get stupid. Want to see me valiantly take down a giant mech? 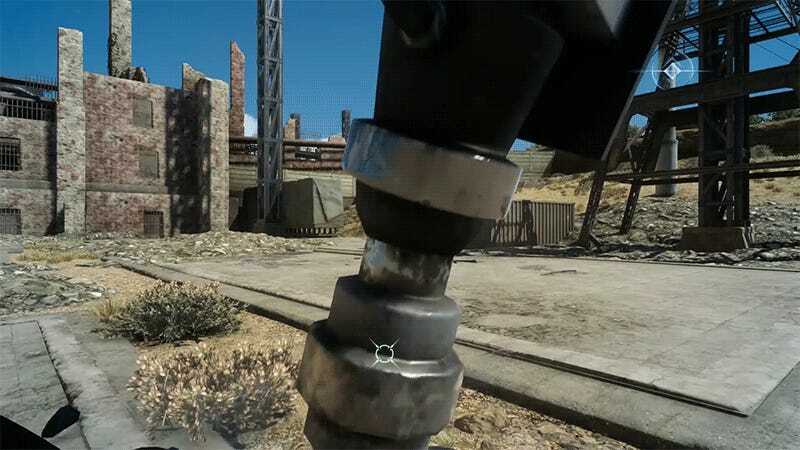 That’s me and an NPC friend, hacking away at the mech’s leg. In the normal, third-person view, this fight is much more impressive. Noctis’ warping mechanic, which sends him teleporting across the screen to recover health and mana or attack enemies, can be straight-up vomit-inducing. 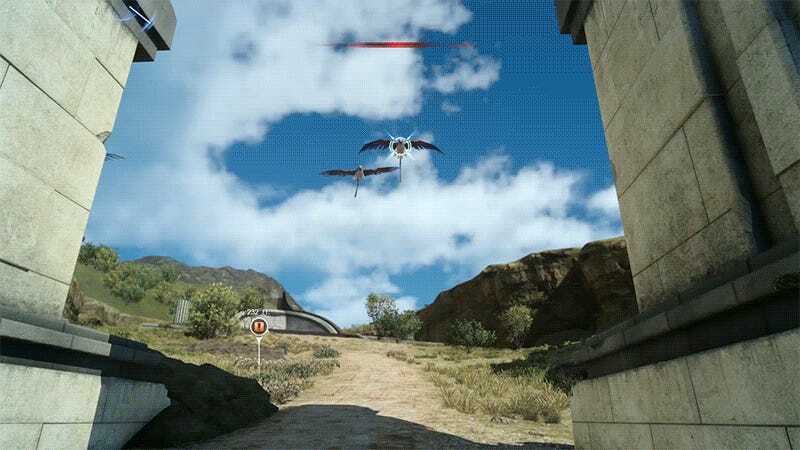 It’s even worse when you are fighting flying creatures. Look at his little bird head! Oh god. So yeah, if you’re planning on taking advantage of this exciting new feature, use it sparingly. And maybe keep a bucket handy.